Depending on the age of your home, your water service line can corrode, deterioate & leak due to age, ground movement and pipe wear. Most water purveyor companys reqiure copper or high density plastic as a replacement for older copper & galvinized lines. With our smaller excavation equipment, we can typically install a new service line in under a day! We trench a small 12'' trench with very little yard disturbance. In most cases we can even pull new lines under driveways, sidewalks & front porches without disturbing any construction! We can also offer site restoration complete with raking, re-seeding & straw to return your lawn even better than new! 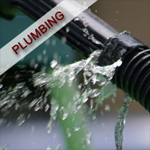 Call for a free water line estimate today.